I’ve been a little tight-lipped on this one, so I purposely didn’t hype this trip up too much in advance like I normally would. Part of it was still slight disbelief that I was actually going to get to play here. On top of that, I didn’t want to jinx anything. Bad weather, road trip mishap, change of heart by our member “sponsor”—many things could have gone wrong. As it turned out, everything went just right. I hit the road after work yesterday and made it up to King City. After an anxious sleep (that alarm better have gone off! 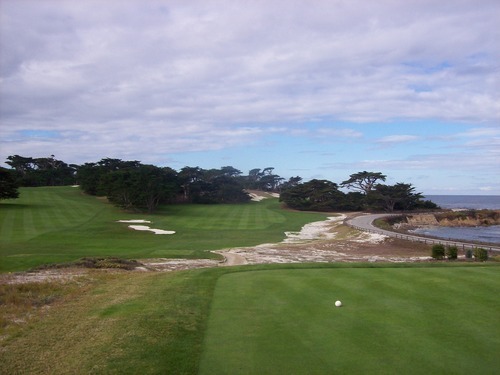 ), I got up early and hit the road again on the way to the Monterey Peninsula…more specifically, Pebble Beach. 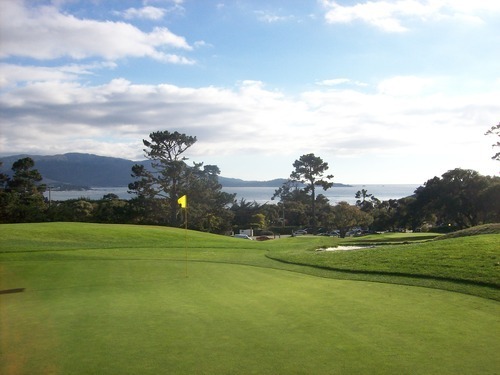 I’ve had the pleasure of playing the Pebble Beach resort courses in the past and would consider them all “once in a lifetime” experiences on world-class courses. 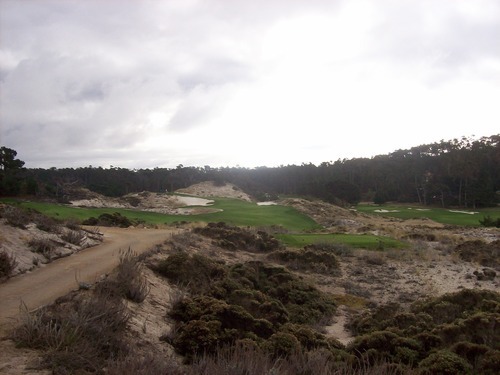 I may return to play one or all of them again someday, but there’s enough other courses in the area I’ve yet to play (as you’ll see the rest of this weekend). 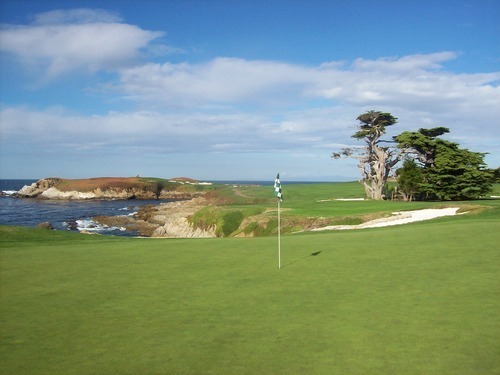 For golfers (especially those of us on the west coast), it represents a piece of heaven on earth. 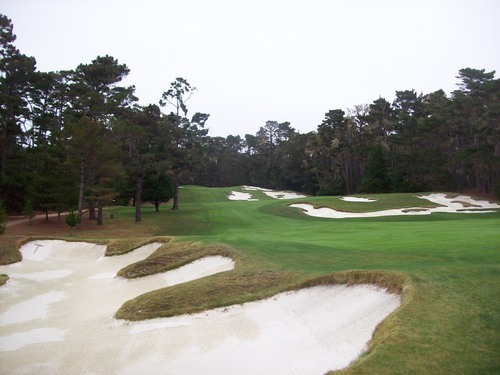 Between it, Augusta National and Pine Valley, you generally have what are considered the top three courses in the country. All very private. 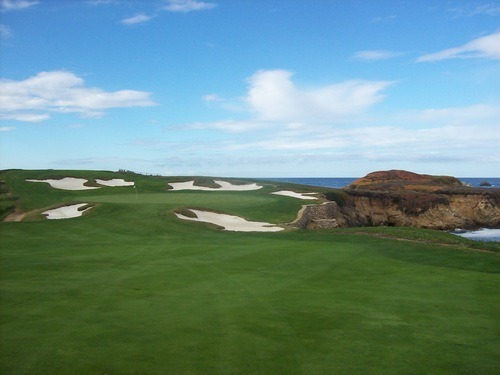 All extremely sought-after on the bucket lists of most avid golfers. With only 250 members here, finding that connection is the hardest part. I figured my chances of ever playing here were pretty slim, but the eyes and ears are always open. So when a friend casually mentioned to me that he might have a hook-up here, I did what I could to get my name in the conversation if it ever came to fruition. After a couple months of following up and planning, it happened today! We had a full foursome that was sponsored for a round by a member. We were told to show up around 7:00 and they’d get us out. Everything about the set-up was surprisingly casual, hence my goal not to jinx anything. The clubhouse and parking lot are small and easy to miss. This is not a big, overblown (or modern) facility. It’s an old club with very rich history. 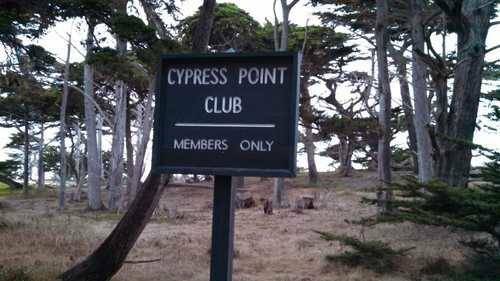 It’s a very casual vibe around the clubhouse and not snooty at all. As a guest, you have access to use the small, quaint locker room to change your shoes and ready yourself. There’s a small pro shop with standard memorabilia for sale. I spent my fair share of cash and walked out with a hat, a towel and shirt. 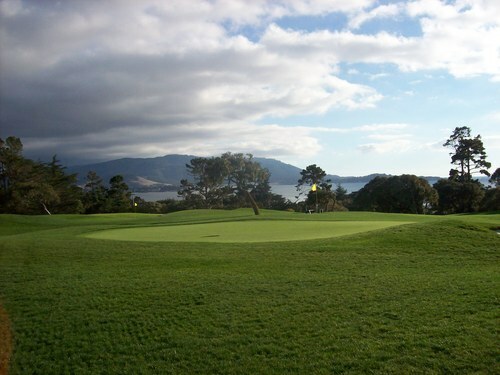 I won’t mention the guest rate, but will say it’s relatively reasonable and much less than you’d pay to play Pebble Beach down the street. Everyone who worked there was very friendly and I was surprised to see a number of unaccompanied guest groups like us there in the morning. We met up with our two caddies (each handled two bags), Jason and Matt, and they also made us feel quite welcome. It was a much more comfortable and inviting experience than I ever expected it to be. We finally were ready to tee off. The first tee box is right next to the clubhouse, so there is a little pressure with a number of people milling around and watching. 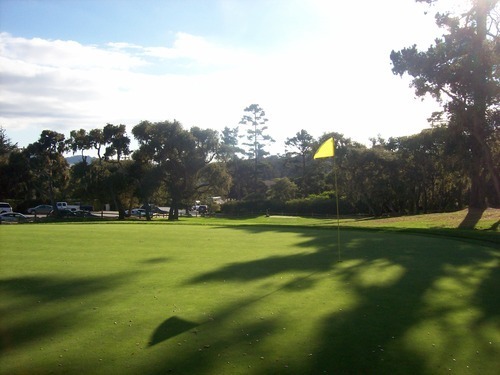 The first hole is pretty straightforward, but there’s a small hedge cutting across in front of you (less than 100 yards from the tee and obscuring a road) that is probably the most intimidating shrubbery you will ever encounter on a course. All you want to do is make sure you clear that tiny hurdle while everyone is watching. I actually led off the group with a nice drive, so I made it successfully. Once the initial nerves wore off and we were a couple holes into the round, I’ll have to admit I was a little underwhelmed with the course. The conditions were very nice, but far from “immaculate” (which is what I envision in my mind). The first few holes are good, but not great. It didn’t seem like anything I hadn’t seen before. Then, by the 5th hole, things started to perk up. 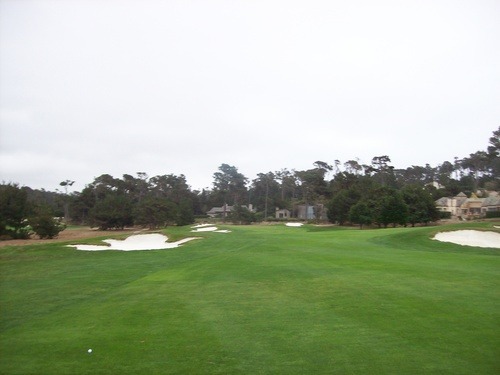 It should be noted that there are three par-5s within the first six holes, which is unusual. 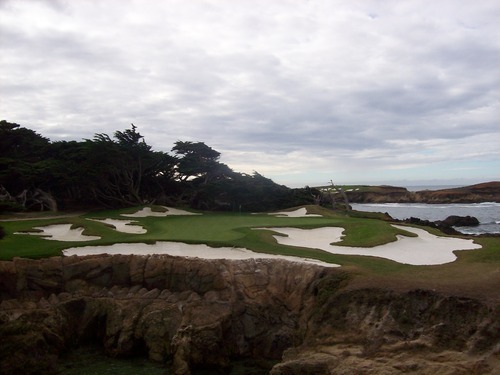 The 5th hole is the second of the three and by far the best. 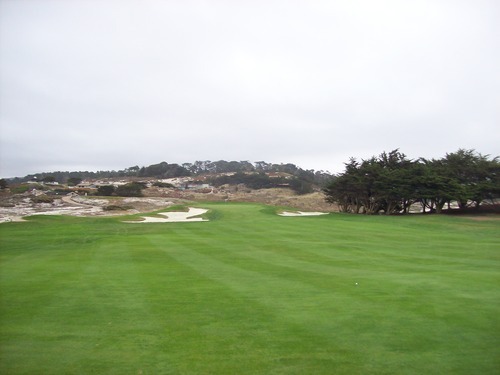 From tee to green, the hole takes several steps upward with each section of fairway its own little plateau. 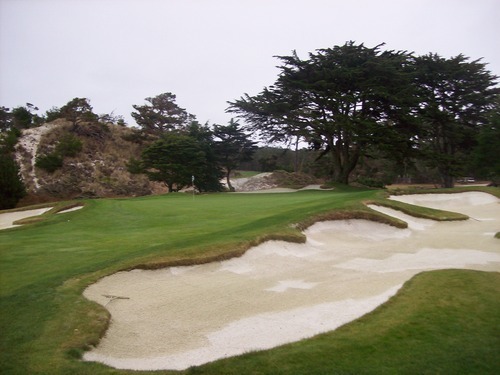 The bunkering on this hole is INSANE and even lay-up shots are tricky. 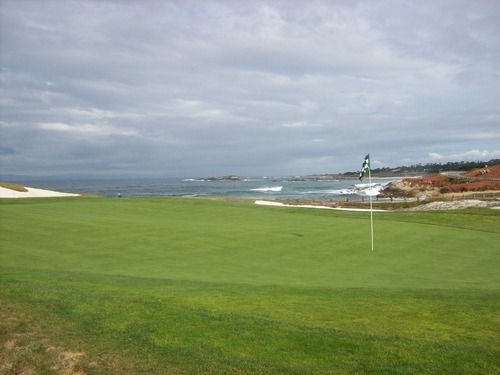 The green is severely elevated with a huge false front and plenty of nasty bunkers surrounding it, as well. It’s a really cool hole. 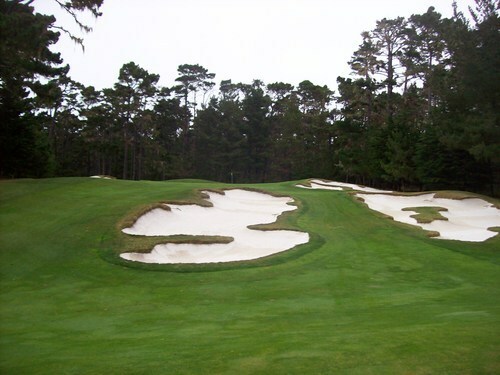 The neatest trick of the 5th is that when you ultimately get to the green and look back at that bunker-riddled fairway of doom, you don’t see any of those sand traps from behind. 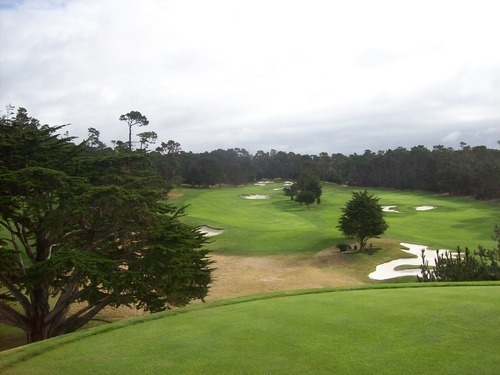 It’s a great bit of visual trickery supplied by legendary course architect Alister MacKenzie. 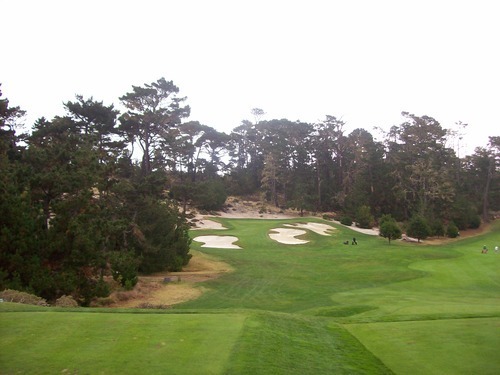 After that, most of the holes are very fun and memorable, including the tricky back-to-back short par-4s (Nos. 8 and 9). 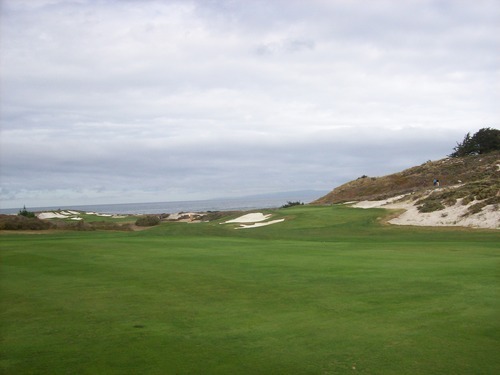 And the sand (in the form of some evil bunker complexes and natural beach dunes) really plays a huge part in the memorability of this course. Basically, your biggest goal should be to stay out of any sandy substance as much as you can here. Otherwise, it will be a long day. 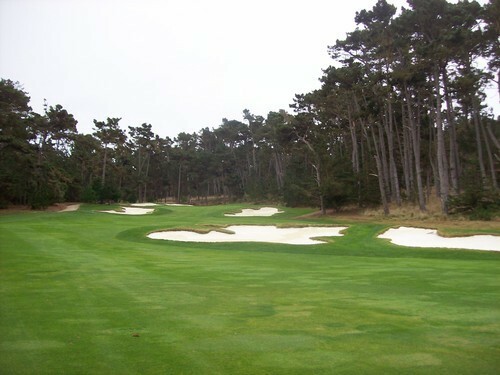 By then, the course had piqued my interest and I was starting to play well, so Cypress had its hooks in me already. But that was just the prelude. 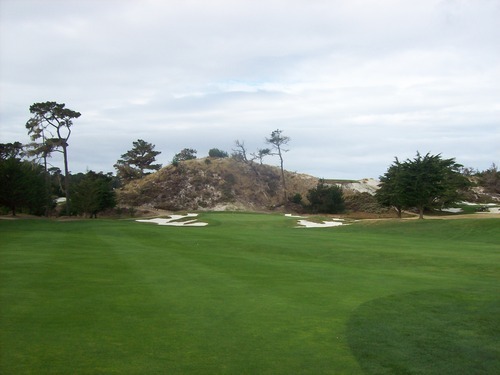 Holes 13-17 make up one of the most beautiful, challenging and dynamic stretches of golf you will find anywhere on the planet. All I can say is…WOW!!! 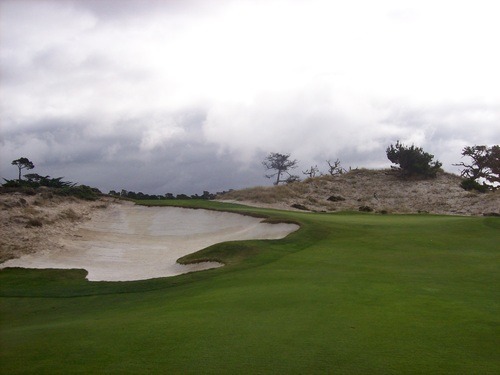 The 13th is a nice par-4 with a green that is surrounded by a cathedral of sand for a very visually intimidating approach shot. It also features some excellent views of the ocean behind it, taunting you with what’s coming up soon. On top of that cathedral of bunkers is the 14th tee box. 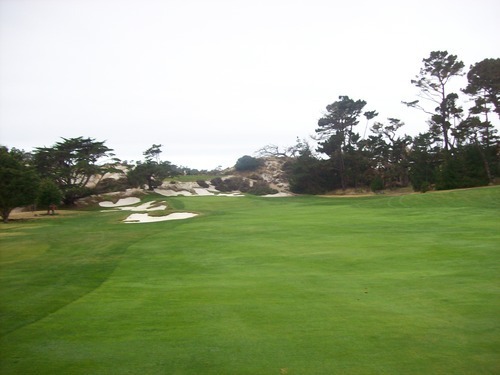 This fairway tightens up significantly at the corner of this dogleg right par-4. 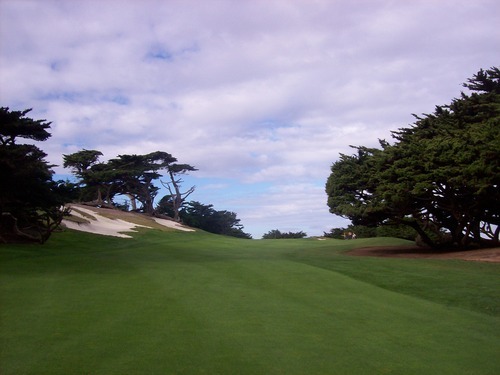 Cypress trees create a narrow approach view to an elevated green. Then, you reach the signature stretch of 15-17. 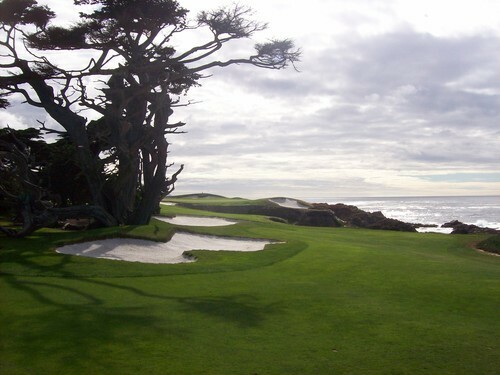 The 15th is a glorious par-3. 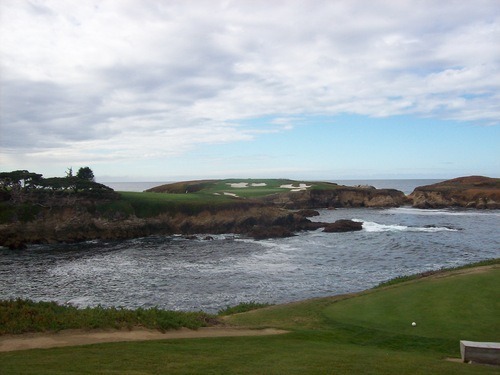 Your tee shot is directly over a small rocky cove. From the blues, it’s only 135 yards. From the whites, where we were playing, it’s just 120. So it’s one you can fire away at with confidence. I did and walked away with a birdie! 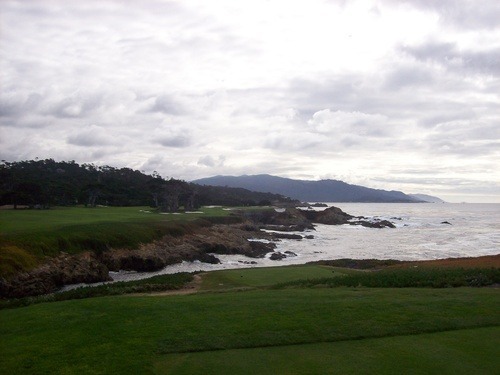 Whatever confidence 15 instills in you is swiftly taken away as you make your way through the wooded trail and come around the corner to the 16th tee—the hole that puts the “point” in Cypress Point. This is easily the most intimidating par-3 I’ve ever seen. 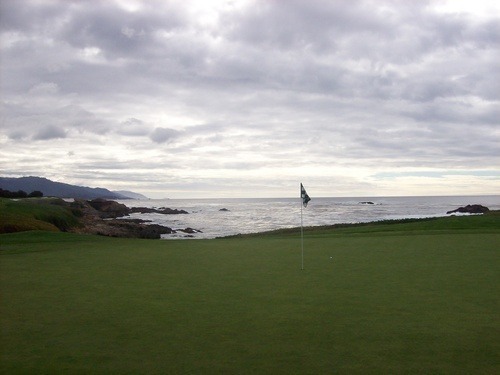 Between you and the green is nothing but the Pacific Ocean and some rocky cliffs. 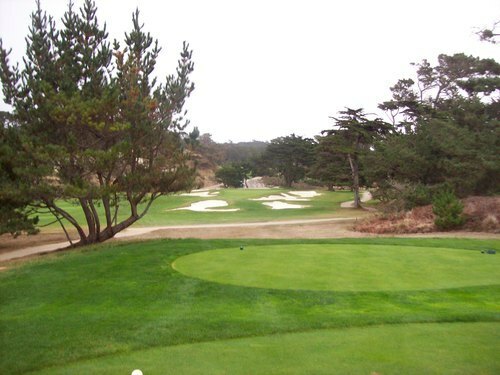 From the white tees, it’s 215 yards and it’s pretty much all carry if you go straight at the green. There’s a lot of bail-out room left, but it’s hard to see where you need to hit to for a lay-up. Our caddies urged us to hit 170 yards well left of where it looked like we should aim (it’s actually part of the 17th fairway). I hit one safe shot per the caddies’ instruction and it worked out well, as I was actually able to get up and down for par. 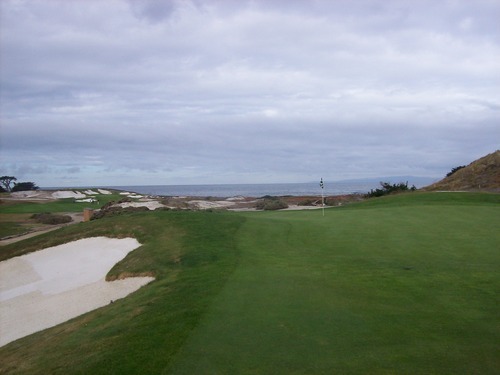 However, you cannot play here and not hit at least one “for fun” ball with a driver directly at the target. Carrying a ball 200+ yards is not really what I do often, but I gave it a huge rip and hit it right on target. Alas, it landed short of the rock wall that guards the front of the green. 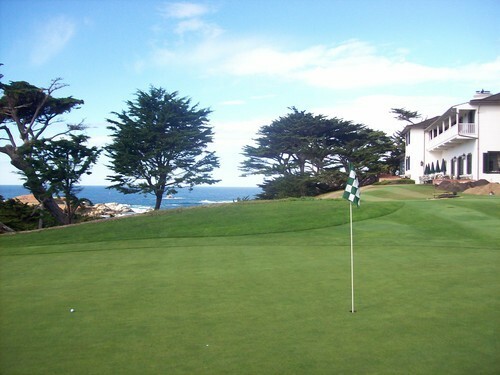 To our amazement, though, the ball bounced off the rocks below and ended up just off the right side of the green! Even though I got lucky there, it proved the point that my original “safe” plan was the best option for me. Oh well, it sure was fun to give it a shot. The 17th doesn’t let down much in terms of scenery or challenge. 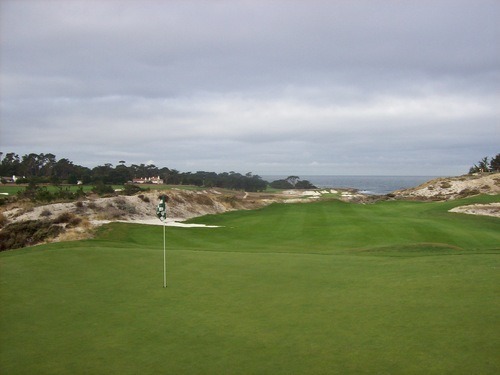 It’s a tough par-4 with the ocean along the right. 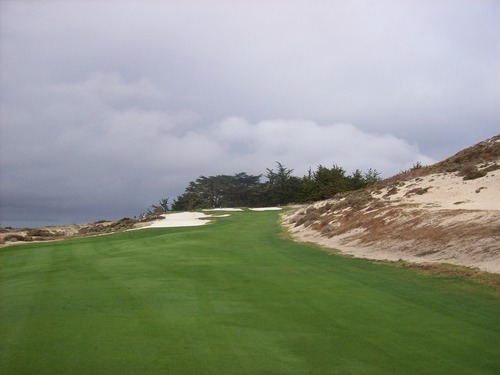 There is a big patch of cypress trees in the middle, so even after a good drive you may have to hit over or around them to a green that’s well-protected by bunkers (oh yeah, and that pesky Pacific Ocean). 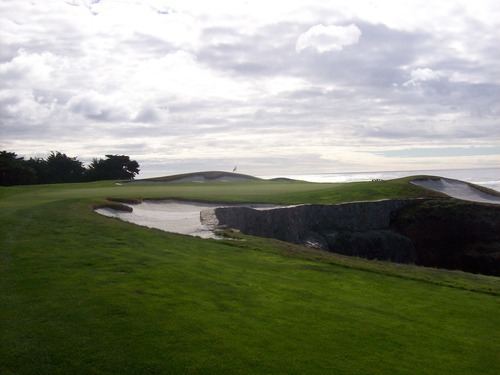 I’ve read some reviews calling the 18th hole a little bit of a let-down after that magical stretch of holes, but it’s still a fun one to finish on. 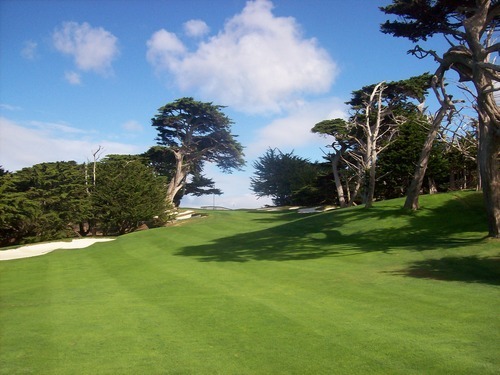 The tee shot is uncomfortable as you basically have to hit over a row of cypress trees for proper positioning in the fairway. 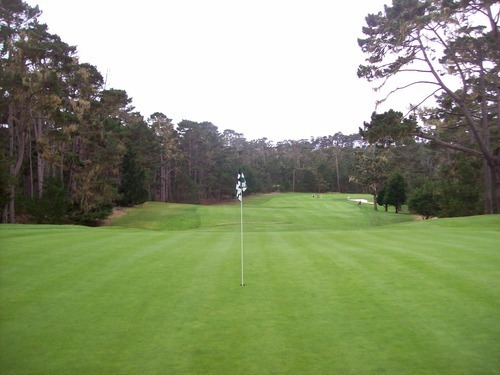 After that, you have a narrow, severely uphill approach to a green with as much back-to-front slope as I’ve ever seen. 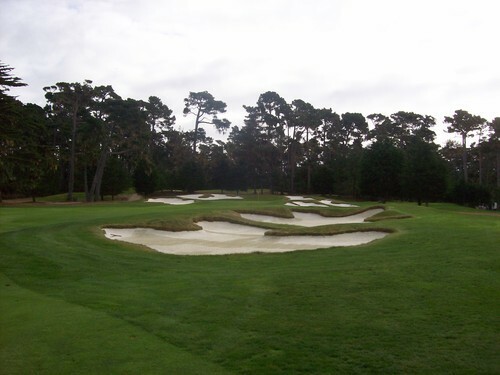 I would agree 17 would make a better finishing hole, but the routing of 18 takes you right back up to the clubhouse and it’s still a really neat little hole that’s also practical in terms of the routing. 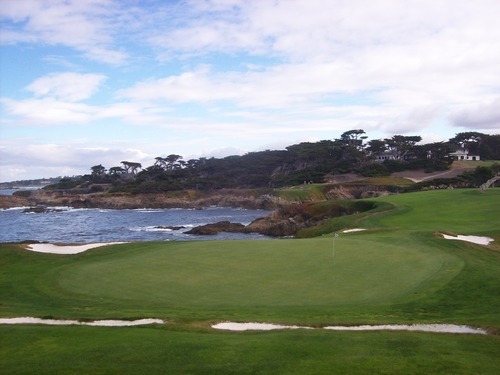 I figure this will be my only chance to play here, so I savored every shot and enjoyed every bit of the walk through Cypress Point’s legendary grounds. 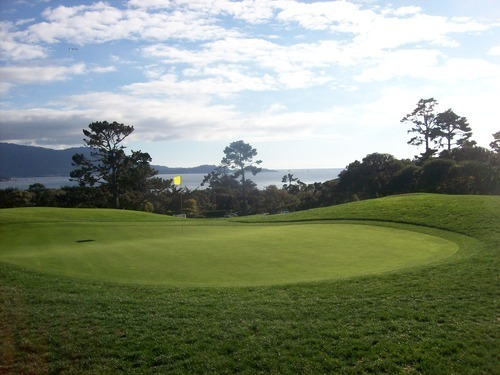 It’s a special course made even more special by the exclusivity of the club. A large part of the thrill is getting to say you’ve played here and, for the most part, the course lives up to the hype it gets. I feel truly grateful for this opportunity and, of course, if anyone has the connections to get me on Augusta or Pine Valley (or any awesome private club), I’m all ears! There’s nothing too exciting to note. 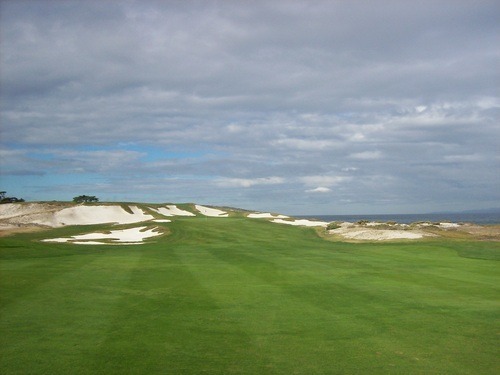 The holes range from about 60 yards up to around 100. 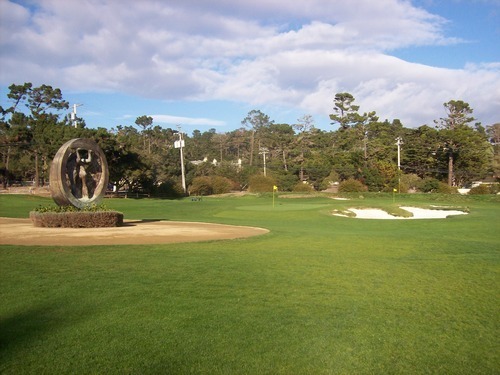 It’s a good little pitch and putt course that also provides a few very nice views of the ocean in the distance. It costs $30, but that rate is good for all day, so you can get your money’s worth. With nobody out there, we zipped around nine quickly and then did an extra loop of six more holes. We had a little fun in the late afternoon, and for me, it was another course to check off the list! 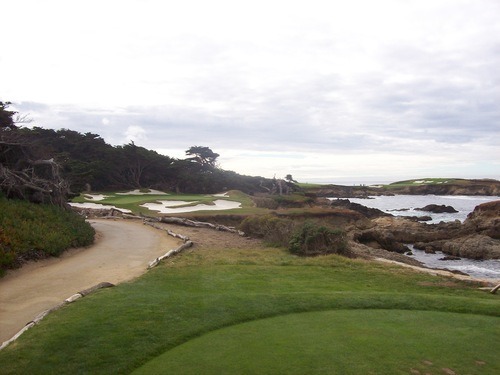 Plus, I am always a fan of contrast, so it’s a funny combo to play Cypress Point and Peter Hay on the same day. 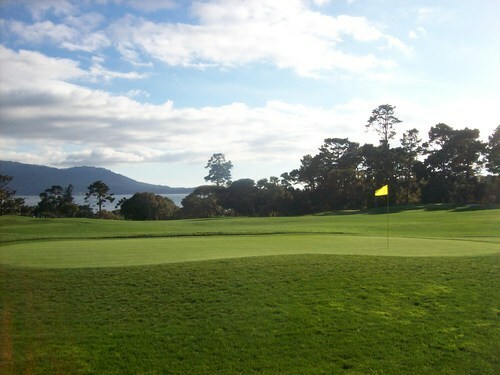 Unfortunately, I got the better weather for photos on the much lesser of the two courses!